At the time I’m sitting here writing–Friday morning, November 4th, 2016–people from all over this country have converged on North Dakota in an effort to stop the Dakota Access Pipeline. Many of those people are Native Americans, whose ancestors endured the very worst colonialism had to offer. All of them are risking arrest to be there; many of them are risking life and limb as well. These people are protesting the destruction of ancestral burial grounds, yes, but they’re also putting their bodies on the line to stop yet another hugely destructive oil pipeline from polluting our waters and our skies, in a way that cannot be undone in our lifetimes, or even those of our grandchildren. Here in the Pacific Northwest, activists have doubled down to do the same–to hold what we call “the thin green line” that keeps new fossil fuel terminals from being built upon our coasts. With carbon rise of 405 parts million associated with business as usual projected to have catastrophic consequences for human civilization (according to Scientific American)–never mind the web of life upon which we depend–companies like Energy Transfer Partners want to build new fossil fuel infrastructure to pump the last remaining stocks from the ground, in the interests of their bottom line. The same fossil fuel stocks that scientists warn us will put us over the edge with catastrophic climate change, now for the generations to come. I fear for these activists, many of them young people–I fear for the risks such extreme times demand. I wrote a novel centered around people like them because I think it’s a goddamn shame that some of our best and brightest, some of most idealistic and true of heart, will be profiled by the federal government as “domestic terrorists” simply for standing up for the future of life on Earth. These activists are putting their bodies on the line against highly militarized police forces serving the interests of the moneyed elite. What gives them courage is the hope that public opinion, public outrage, and public pressure, will call off the dogs–that our political system will, at the end of the day, be swayed by the will of the people. I have my critiques of Hillary Clinton, but she is someone I believe can be swayed–someone who’s actively gathering information about the world, in the interests of a country that works for everyone. I have no such confidence in Donald Trump. I believe he’s not only dangerously out of touch with the truth of climate change, he does not care about public opinion–no outrage can sway him, no call to conscience or compromise. In word and deed, he has revealed himself a petty dictator, a man born to privilege who still somehow imagines himself tough. In the face of such a presidency, more of the people on the front lines of the climate movement will be brutalized. In the face of such a presidency, the climate movement as it stands could, in fact, be crushed, shredding our hopes for a livable future. 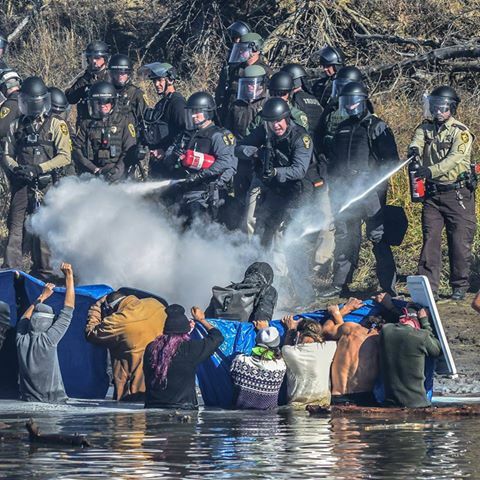 That’s why I’m dedicating my No Trump Vote to Standing Rock–to the kayaktivists of the Coast Salish, to the First Nations Peoples on the front lines of the climate struggle throughout the Americas, to the activists on both coasts holding that “thin green line,” and to those working to halt the destruction of the natural world everywhere. Susan DeFreitas is the author of the debut novel Hot Season, which Read It Forward hailed as “earth-shatteringly good.” Available online through Powell’s and Barnes & Noble (ebook via Amazon).